Interested individuals should supply a letter of intent, resume, and a short production proposal for each project application. Application deadline for “Lend Me a Tenor” is November 30 and all materials should be mailed to the attention of: SAAC Theatre Selection Committee/110 E. 5th Street, El Dorado, Arkansas, 71730. SAAC’s theatre task force has selected Ludwig’s Tony Award winning farce “Lend Me a Tenor” for the spring production. Auditions are scheduled for January 18 and 19, 2016 with production dates scheduled for March 3-6 and 10-13. “Lend Me A Tenor” is set in September 1934. Saunders, the general manager of the Cleveland Grand Opera Company, is primed to welcome world famous, Tito Merelli, Il Stupendo, the greatest tenor of his generation, to appear for one night only as Otello. The star arrives late and, through a hilarious series of mishaps, is given a double dose of tranquilizers and passes out. His pulse is so low that Saunders and his assistant Max believe he’s dead. In a frantic attempt to salvage the evening, Saunders persuades Max to get into Merelli’s Otello costume and fool the audience into thinking he’s Il Stupendo. A sensation on Broadway and in London’s West End, this madcap, screwball comedy is guaranteed to leave audiences teary-eyed with laughter. “Lend Me a Tenor” has been labeled “One of the classic comedies of the 20th century” by The Washington Post. “110” is a slice of Americana that focuses on Lizzie Curry, a spinster living on a ranch in the American southwest, and her relationships with the local sheriff File. File is a cautious divorcé who fears being hurt again. With their relationship as a background, a charismatic con man Bill Starbuck appears, posing as a rainmaker who promises the locals he can bring relief to the drought-stricken area. Auditions for “110” are scheduled for May 20 and 21, 2016, and performances are scheduled for July 14-17 and 21-24, 2016. SAAC’s salary schedule is competitive and will be set according to experience. Lodging will also be provided if necessary. There will also be opportunities for the director to teach workshops and classes. 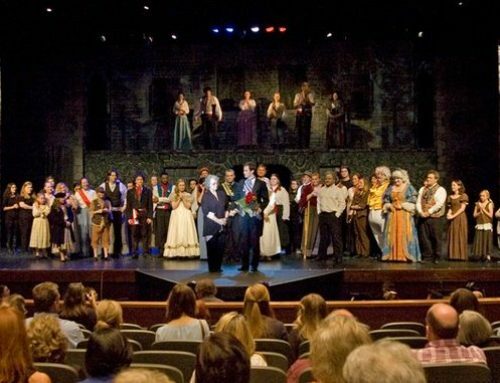 Qualifications include some directing experience and knowledge of community theatre. SAAC is a complete visual and performing arts center that includes three gallery spaces, a ballet studio, a 206 seat theatre, a scene and costume shop, classrooms, a photography studio, and offices all of which provide AIE residencies, monthly gallery exhibits, community theatre productions, classes in visual arts, ballet, photography, drama, and music for people of all ages and people with special needs.